GSB0015 is GSB0014 covalently linked to HRP (Horseradish Peroxidase).GSB0014 specific to human kallikrein 1 (hK1) can greatly improve the effectiveness of several different kinds of immunoassays, such as ELISA,Western blot and Dot blot. GSB0014 is produced from the hybridoma which is fusion of Sp2/0-Ag14 mouse myeloma and B-lymphocytes obtained from mouse. After hundreds of selection cycles, our researchers successfully isolated an antibody against hK1 with high specificity and sensitivity. 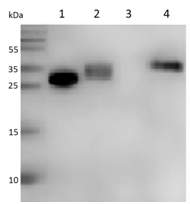 GSB0015 is produced by GSB0014 (HRP-coupled).The monoclonal antibody GSB0014is produced by mice immunizing with full length human kallikrein 1, derived from plasma or urine. Storage: GSB0015 is stable for one year if stored at -20°C from the date of shipment. Working concentration for specific applications should be determined by the end user. The appropriate concentration may be affected by many factors, such as secondary antibody affinity, the sensitivity of the method of detection, temperature, incubation duration etc. The suitability of this antibody for applications other than those listed below has not been determined.